The impact of post-traumatic stress disorder (PTSD) can reach far beyond the individual with PTSD, affecting the lives of friends and family caring for someone with PTSD. How can you recognize and cope with this stress as a caregiver for a loved one with PTSD? Receiving support from others is very important during times of stress. Seeking support from another person is a healthy and effective way of dealing with a stressful event. During times of stress, people often turn to their loved ones first for support. It is important to realize that providing support requires energy and can be stressful. It can be upsetting and stressful for a partner or spouse to see someone they care about struggling with a problem. Most times, a partner or spouse will be able to provide support without feeling too taxed themselves. However, when the stress is constant and support is frequently needed, "caregiver burden" may occur. PTSD can be viewed as a chronic illness, and the person with PTSD may require constant care from a loved one, such as a wife or husband. Partners of people with PTSD may be faced with a number of stressors that go along with caring for and living with someone with a chronic disease. These stressors include financial strain, managing the person's symptoms, dealing with crises, the loss of friends or the loss of intimacy. Due to a loved one's illness, partners may be the only people who can take care of such stressors. This puts a large burden on them, and as a result, they may experience tremendous strain and stress, or caregiver burden. A few studies have looked at caregiver burden among partners caring for loved ones with PTSD. A brief discussion of two of these studies is provided below. In one study, researchers looked at 58 spouses of veterans with PTSD. They found that the severity of the veterans' PTSD symptoms was connected to the amount of caregiver burden and distress experienced by the spouse. In other words, as a spouse's PTSD symptoms got worse, so did the caregiver's amount of burden and distress. Other researchers did a similar study with spouses of veterans with PTSD. They found that as PTSD symptoms worsened so did the amount of caregiver burden experienced by the spouse. They also found that violent behavior in the relationship (such as pushing someone, throwing things, physical abuse) was linked with caregiver burden. Studies looking at the wives of combat veterans have found that this stress can have damaging consequences psychologically. Among wives of combat veterans with PTSD, there was an increased risk not only of PTSD, but somatic disease, clinical depression, panic disorder, generalized anxiety disorder, and an increased level of suicidality. It is important that caregivers have basic information about PTSD. Simply knowing the symptoms of PTSD and where they come from, can help caregivers gain a better understanding of their loved one's diagnosis and behavior. Mental health professionals recognize the stress that comes with caring for a loved one with PTSD. 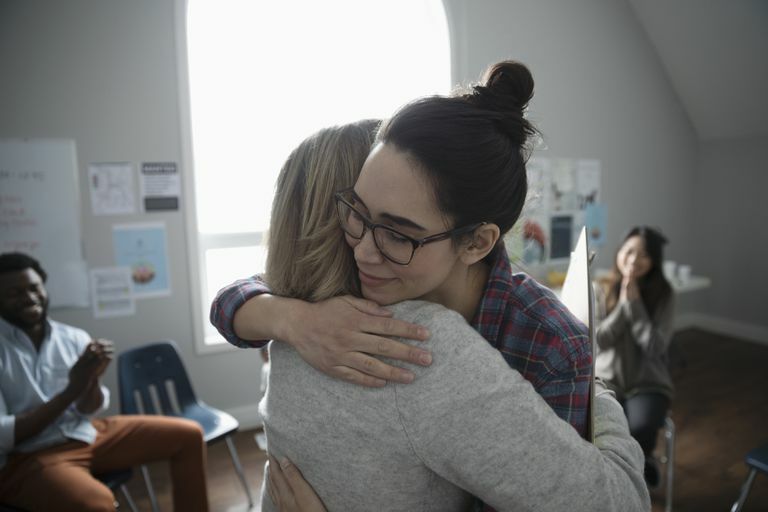 Caregivers may also benefit from attending individual therapy or support groups to find support for themselves, and to learn how to cope better with their loved one's PTSD. Couples counseling may also be useful. Recently, online support groups have popped up, giving caregivers the opportunity to talk 24/7 with other caregivers of people with PTSD. As with any support group, it's important to know that while many of these provide excellent support, some groups can actually make you feel more depressed. If you choose to go online, make sure to connect with people who share your challenges but support you in coping. Unfortunately, despite the significant impact of PTSD on family and friends, remarkably little research has looked at methods of helping caregivers cope with this stress. In addition, most of the research is dated and focuses on the incidence of caregiver burden rather than any effort to look at ways of reducing the burden. Not only is the health of caregivers important and worthy of more research, but these caregivers are also the primary source of support needed by those living with PTSD. Until more is known, caregivers of people living with PTSD may wish to look at ways that caregivers of those with other conditions such as dementia and cancer have coped with their challenge. Learn to recognize the signs of caregiver burnout. Caregivers may feel guilty if they take time for themselves; however, it is important for caregivers to realize that they too need time to "recharge their batteries." Living with and caring for someone with PTSD is stressful. unlike some conditions which are short-term, PTSD is a chronic condition that can feel unending at times. It is a marathon rather than a sprint, and as in a marathon, it's important for caregivers to pace themselves and take time to rest. The more a caregiver can learn how to care for themselves, the better they will be able to care for others. Some of these simple tips for caregivers of cancer patients pertain just as much to caregivers of people with PTSD. Hopefully, the stress impact n caregivers of people with PTSD will be studied more carefully in the near future, not just to document the presence of stress, but to look for ways in which caregivers can best cope. Beckham, J., Lytle, B., and M. Feldman. Caregiver Burden in Partners of Vietnam War Veterans with Posttraumatic Stress Disorder. Journal of Consulting Clinical Psychology. 1996. 64(5):1068-72. Calhoun, P., Beckham, J., and H. Bosworth. Caregiver Burden and Psychological Distress in Partners of Veterans with Chronic Posttraumatic Stress Disorder. Journal of Trauma and Stress. 2002. 15(3):205-12. Kalra, H., Kamath, P., Trivedi, J., and A. Janca. Caregiver Burden in Anxiety Disorders. Current Opinions in Psychiatry. 2008. 21(1):70-3. Klaric, M., Franciskovic, T., Obrdalj, E., Petric, D., Britvic, D., and N. Zovko. Psychiatric and Health Impact of Primary and Secondary Traumatization in Wives of Veterans with Posttraumatic Stress Disorder. Psychiatry Danubina. 2012. 24(3):280-6. Yambo, T., and M. Johnson. An Integrative Review of the Mental Health of Partners of Veterans with Combat-Related Posttraumatic Stress Disorder. Journal of the American Psychiatric Nurses Association. 2014. 20(1):31-41.